Reflecting is Jimmy T.'s boss stage in WarioWare: D.I.Y. 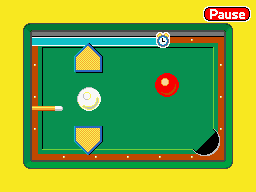 The game is based on the sport of billiards. The point of the game is to knock the red billiard ball into the pocket while keeping the cue ball from going in. The player first needs to find out where to shoot first. Usually, the ball has to be hit at an angle for best performance. Tapping the screen causes the pool stick to hit the cue ball. When the cue ball hits the other ball, it rebounds off of the table. If the other ball goes in before the cue ball, the game is won. However, if the cue ball goes in before the other ball or time runs out, the game ends in a loss. This page was last edited on July 18, 2018, at 22:40.